The Kamini Vashikaran Yantra is among the more famous and popular Akaarshan Yantras and is considered to be a very effective love spell. Today I will explain how this Yantra can be prepared by anyone. This Yantra is used to attract an unresponsive person, with whom you are in love, but this person is not reciprocating your love and affection. This Yantra is prepared on a thick piece of copper and kept in the place of worship and then energized by performing a Panchopachara Puja; details on this Pooja are explained in this - POST. Then to use the Yantra to attract the unresponsive lover a Diya of Clay has to lit in front of the Yantra and the lit wick of the Diya should face the direction of the home of the unresponsive lover. 1. Can't we make it on a white piece of paper with red ink? 2. The post says that the wick should face the home of the person targetted, so shall we place the clay lamp in our house or in front of house of the targetted person? Can you post the yantra images clear. The watermark overlaps well and not able to see the hindi letters in clear. I want to try this spell but I regret to say that the watermark is over lapping the mantra.I am unable to see the mantras clearly.Please help. Dear sir, I don't know Hindi, can you please post this Yantra in English. 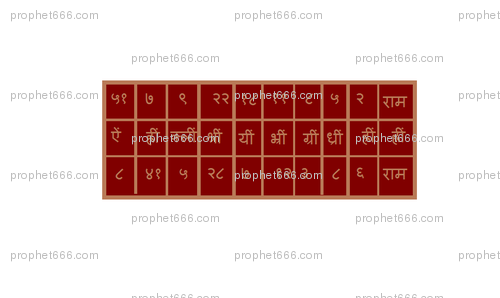 If all the Yantra's are also posted in English as well as Hindi it will be very useful for people(followers) like me. Thanking you sir. neel sir, is this aghori in nature? can i eat nonveg on the day of making it? Aghori or Satvik qualities depend on your intention. There is no bar for non-veg food on the day of making the Yantra, but it is best to avoid non-veg on that day. is it necessary to light the clay lamp everyday before the yantra? Only once, when you perform the actual Vashikaran Experiment as described in the article.